Brändön Lodge is located just north of Luleå overlooking the archipelago. With a total of approximately 1,250 islands and only 100, residents the archipelago is a unique wilderness environment. In summer this is a warm and sunny region, one of the sunniest in Sweden and a paradise for activities such as swimming, fishing, boating and kayaking. 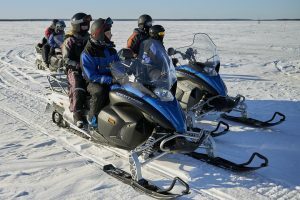 In the winter however the sea around the island freezes up to a meter thick and becomes a playground for activities such as snowmobiling, dogsledding and even hovercraft tours. The following 4 night package is bookable online from January 7th to February 3rd or from February 24 to April 14. Just book and pay oneline opposite and let us know the four nights you would like to spend with us. Your flight from Stockholm to Luleå takes only one hour where we will be waiting to meet you. The first afternoon is well spent getting to know us, selecting your warm winter clothing and relaxing. A delicious 2 course dinner awaits you in the restaurant in the evening and after dinner we will give you tips on the best place to perhaps catch a glimpse of the northern lights later in the evening. If you are truly ready to wind-down then we recommend our optional sauna and hot tub under the stars while waiting for the aurora. Closeness to nature is part of our daily life and today we will spend some time together discussing the forest and the frozen sea and the nature that surrounds us. 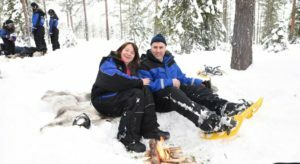 We will give you some tips on how to live and stay safe in the arctic region in our Nordic Winter Skills activity, that includes lunch, and look for tracks and signs from the variety of wildlife that lives in the area. 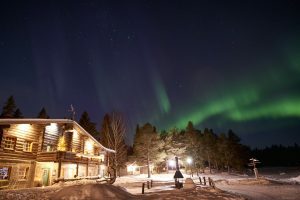 In the afternoon, you can relax, take a walk or consider one of the many optional activities available before dinner and then northern lights spotting. Today we take the short journey by road to our local husky kennel. Here you and a partner will drive you own dogsled team for an hour. This evening, after your dinner in the restaurant, you can relax and spend some time looking for the aurora in the northern sky. Waking to a new day by the sea and after enjoying breakfast we will prepare for our feature 4-hour archipelago nature adventure that includes lunch. We use a snowmobile to explore the frozen sea and islands of the archipelago. Out on the islands we will search for wildlife and the pack-ice formations. This evening, after your dinner in the restaurant, you can relax and spend some time looking for the aurora in the northern sky. Depending on your time of departure you will have part of this morning to relax and enjoy the lodge before we unfortunately bid you a fond farewell. Your transfer will be arranged at a suitable time to take you to the airport or train station for your journey home. Pricing is based on 2 adults or 2 adults and 1 to 2 children in a cabin. Please contact us if you have more that 2 adults or 2 children and/or a group booking. 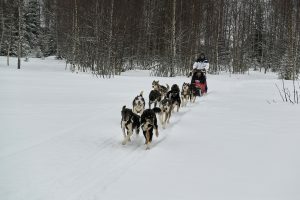 Let us know if you would like to upgrade to one of the longer dog-sledding or snowmobile tours shown on our activities. Options for additional activities to be booked in advance or on site.